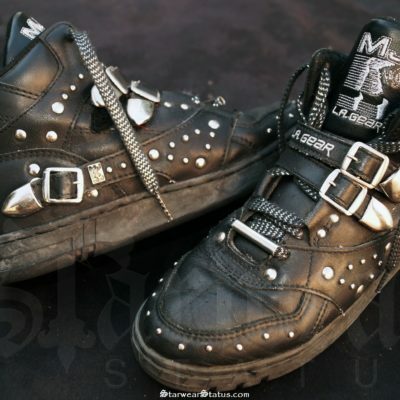 Michael Jackson’s “BILLIE JEAN” Untoppable LA GEAR Velcro Buckle/Studded Hi Top Shoes. – DEADSTOCK! These Michael Jackson LA Gears originally dropped in 1991 and were the hottest releases Michael Jackson himself launched in the early 1990’s. Michael Jackson Vintage Red LA Gear “Billie Jean” High Top Shoes Size 6 1/2 VERY RARE!! 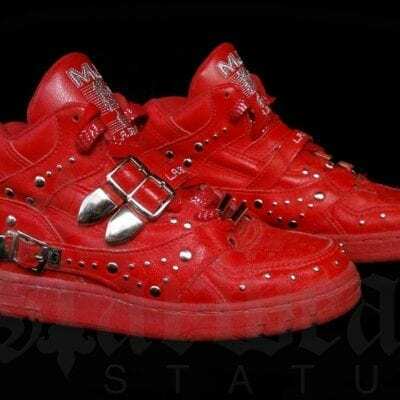 These Michael Jackson LA Gears originally dropped in 1991 and the “REDS” were/are the rarest colorway editions ever released in the early 1990′s. Exclusive Fact: *These are the rarest colorway editions ever released! *Forget about the TYGA re-release, when you can have the Original Collectibles “Michael Jackson” himself launched back in the 90′s. Women’s US Size: 6 1/2, Euro: 37 British: 4. Details: Checkout the famous Michael Jackson stamp insignia and “LA Gear” branding. 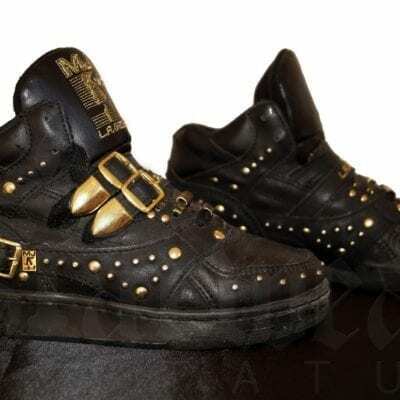 Featuring two Velcro buckle closures & studded embellishments all over, with famous MJ stamp insignia and LA gear branding. These Michael Jackson LA Gears originally dropped in 1991 and were one of the hottest releases of the early 1990’s. Exclusive Fact: *These are one of the rarest colorway editions ever released! *Forget about the TYGA re-release, when you can have the Original Collectibles “Michael Jackson” himself launched back in the 90’s. 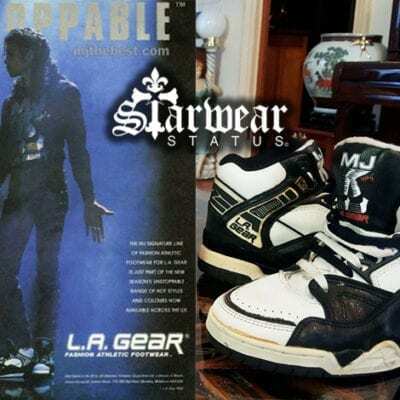 These Michael Jackson LA Gears originally dropped in 1991 and were one of the hottest releases of the early 1990′s. 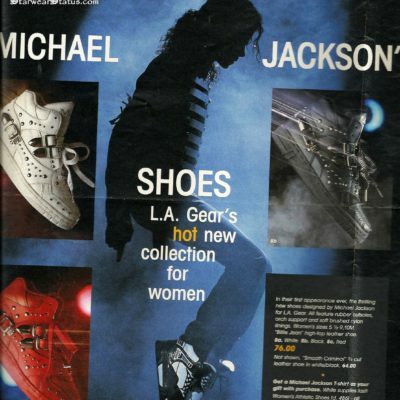 *Michael Jackson “Photo-Shoot” Famous LA Gear Unstoppable High Top Sneakers Black/White. 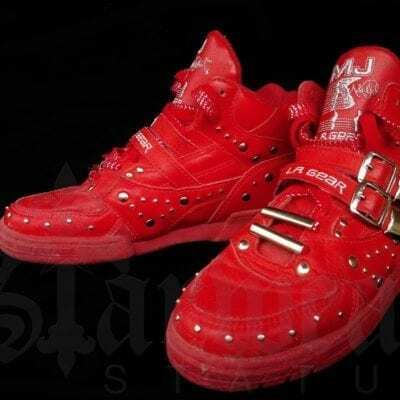 Exclusive Fact: Only released in very limited quantities from this particular MJ LA GEAR Shoe Release. Women’s US Size: 4, Euro: 36 UK: 3. CM 23. Condition: These LA Gear's are In immaculate Unworn condition with inner soles that are pristine! with famous MJ stamp insignia and LA gear branding.